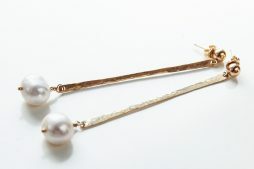 Pearl earrings in gold or silver. Hammered bars with white freshwater pearls. Wedding jewelry, June birthstone gifts. 5 mm ball post earrings with hammered gold filled or sterling silver bars. Ivory color 10 mm round Freshwater pearls are finishing earrings. Beautiful, trendy and timeless style earrings.